The Westbridge, an upscale 158-unit condominium building near the Georgetown neighborhood in Washington, D.C., is a small front in the fight against climate change, but its importance is growing. This building and many like it are shouldering more of the burden of reducing greenhouse gas emissions in the United States now that the Obama administration's signature climate policy is on hold. With the Supreme Court stay of the Clean Power Plan in February, advocates say some of the climate change battle lines have moved from power plants and factories to offices and condominiums. Built in 1978, the 184,000-square-foot brown brick building with concrete columns embarked on a quest to reduce its utility bills. Kathleen Hogan, who runs the energy efficiency division at the Department of Energy, says raising the bar for energy hogs avoids millions of tons of carbon emissions and saves billions of dollars. Photo courtesy of DOE. "We all complained about electricity and energy consumption," said the Westbridge's general manager, Michael Barge. "That was the most we could think of until benchmarking came up." A nudge came from the District of Columbia's Department of Energy and Environment. The 2008 Clean and Affordable Energy Act required all private buildings enclosing more than 50,000 square feet within the District to report their energy and water consumption to the city energy department every year. This engulfed more than 1,800 buildings in 2014, up from 330 buildings in 2011. After conducting an energy audit, Barge said he went to work. "From August to December of 2015, we upgraded to LED light bulbs throughout our common area in the hallways," he said. "We saved over $12,000 in those few months compared to bills from the prior year." From there, Barge examined air conditioners, air handlers and chillers, installing new equipment when it hit the right combination of cost, savings and payback time. "Some of our board members were like, 'Ah, it's just a gimmick,' until they saw our bill," Barge said. Though cutting carbon emissions at the Westbridge was not the goal, it was an important side effect. The Obama administration has framed policies that promote energy efficiency as the cheapest and fastest global-warming-fighting tactic, winning hearts and minds with dollars and cents. "I'm going to take credit for some of the folks that have been working on energy efficiency programs for so long and have done a remarkable job in making those seem like they're not about climate change," EPA Administrator Gina McCarthy said to an efficiency industry meeting in 2014. "They are" (ClimateWire, June 13, 2014). An arduous process -- but worth it? However, the emissions accounting can be tricky, efficiency rules can backfire and industries often move faster than regulations can keep up. As new product categories emerge, efficiency will have to be a major design consideration to make sure the world makes progress in cutting carbon emissions instead of running to stand still. The same week the Supreme Court blocked the Clean Power Plan, the Department of Energy proposed new standards for light bulbs that could save $9.1 billion by 2030 and eliminate 52 million metric tons of carbon dioxide emissions (E&ENews PM, Feb. 12). 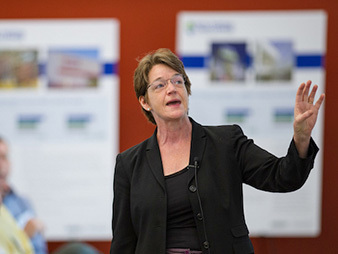 Kathleen Hogan, deputy assistant secretary for energy efficiency in the Office of Energy Efficiency and Renewable Energy at DOE, explained that the agency sets an efficiency floor and takes its cues from Congress. "We set minimum standards, and nobody can manufacture or import a product that does not meet that efficiency standard," she said. Getting Congress to even consider energy efficiency proposals can be an ordeal. The Shaheen-Portman energy efficiency act, proposed in 2013, was pared down into a smaller bill, the Energy Efficiency Improvement Act of 2015, and signed into law last year (E&E Daily, May 1, 2015). After receiving authority from lawmakers, DOE then needs to go to manufacturers, suppliers and consumers to determine the appropriate standards for light bulbs, televisions or refrigerators. "At a high level, a rulemaking process can take two to three years," Hogan said. "This is something that is done with a lot of steps and engagement with industry and stakeholders." The result is usually a rule that takes some of the worst energy offenders off the market and may cut greenhouse gas emissions. Late last year, DOE issued new standards for commercial air conditioners and furnaces that would save businesses $167 billion over the lifetime of these products and avoid 885 million metric tons of carbon dioxide emissions. "That one's particularly exciting because that one turns out to be negotiated rulemaking and the largest energy-saving rulemaking in the department's history," Hogan said. Some in the industry have lauded the role of efficiency regulations for the climate fight. "I think it has a profound impact because it raises the low bar everyone abides by," said Jonathan Lemmond, a senior consultant at Baumann Consulting, an efficiency consulting firm that worked with Barge to cut energy use at the Westbridge. Researchers at the Lawrence Berkeley National Laboratory published a study in 2013 that found that efficiency programs like home weatherization and behavior modification would almost completely offset projected energy demand growth by 2023 (ClimateWire, Jan. 18, 2013). The United States as a whole has managed to curb its greenhouse gas emissions over the past few years while growing its economy, a trend that's now visible on a global scale (ClimateWire, March 17). "The most important single contributor has been improvements in energy efficiency," said Ralph Cavanagh, the energy program co-director at the Natural Resources Defense Council. But regulations aren't the only option. In fast-moving industries like consumer electronics, the rulemaking process often is too slow, is too aspirational and doesn't recognize how products and consumer behavior change. "With respect to governments, it's very important to realize that there is more than one path to efficiency goals," said Douglas Johnson, vice president for technology policy at the Consumer Technology Association. "What we have to avoid is committing to something that has yet to be proved." Devices like digital video recorders and video game consoles have cropped up in millions of homes and grown more capable and energy-hungry. In some homes, set-top boxes that record television shows and stream content can be the second-largest energy user in the home behind air conditioning (ClimateWire, May 4, 2015). In 2012, cable providers serving more than 92 million subscribers in the United States signed a voluntary agreement to improve energy efficiency in their set-top boxes. The agreement holds that 90 percent of these devices procured after 2013 must meet EPA's Energy Star Tier 1 efficiency guidelines, verified by independent auditors. After 2016, set-top boxes have to meet more stringent Tier 2 requirements. According to the industry's annual report on the agreement, more than 95 percent of set-top boxes purchased in 2014 met Tier 1 standards, and more than 62 percent already met Tier 2 benchmarks. The report cautions that as these devices gain features, meeting these targets will get more challenging. However, when it comes to mitigating climate change, one can't simply upgrade all hardware to the most efficient product. If energy efficiency leads to more consumption, it threatens to undermine the gains from using less energy. "I don't think there's anyone out there that denies the possibility of energy rebound," said Roland Geyer, an associate professor at the Bren School of Environmental Science and Management at the University of California, Santa Barbara. "I think the big controversy is, 'How big are these rebound effects?' and that can be quite difficult to quantify." Geyer co-authored an article earlier this month in the Stanford Social Innovation Review that argued that labeling products as "green" is misleading because it overlooks important aspects of energy consumption. Instead, Geyer and his co-author, Trevor Zink, an associate professor at the College of Business Administration at Loyola Marymount University, called for a metric called "net green," which not only includes how much energy a device like an LED bulb uses, but the energy used to make it, the energy used to dispose of the old bulb and how many more lights are used now that their energy cost is lower. It means buyers will have to carefully consider whether it's worth upgrading to a new, more efficient air conditioner, plus the energy costs to make it, if the old one with sunken energy costs still works. "It's mostly a function of what dominates: Energy consumption during use or energy consumption during production," Geyer said. Nonetheless, Geyer acknowledged that pushing for energy efficiency is likely the easiest political option for curbing greenhouse gas emissions. "I think there's sort of a natural tension: We want to limit energy consumption. On the other hand, societies have always strived for economic growth," Geyer said. "Energy efficiency can be a real driver of economic growth."